when I was a teenager at boy's camp. we play called " speedball " was refer association to football, rugby, soccer, and basketball. both men and women can play. in schools, they don't play speedball, in general, most people never heard of it, American schools would never play rugby in gym class. American kids never drink tea at tea time. How about the USA's women's soccer team? They are one of the best out there and they are better than their male counterparts by a long shot. I enjoy watching them in the world cup. It's a shame that Hope Solo made an utter arse of herself in the last final Team USA played in. She's been a great goalkeeper for USA and really should have gone out on a better note than that. Why did you do it, girl...? Association Football is considered a women's game in US so the resources put into the game over there have been concentrated on building a strong women's team. We're only just coming out of the dark ages here in England where women's football is concerned. We've got a good team now, but it's taken a lot of getting there. We had a terrific female manager, Hope Powell, who virtually constructed the EWFA (England Women's Football Association) from nothing to being World Cup Quarter Finalists. She built EWFA from schoolgirl level right up to full senior level and even found a way to create a professional league..!! But she made enemies in the establishment and they threw her out and her replacement took all the credit for the crop of brilliant players she nurtured from rock bottom and who are in the team now as top professionals. She was replaced by Mark Sampson, a man who was later found out to have a history of sexual abuse toward younger players and racist behaviour towards black players. He was sued by one of the players for being dropped from the team because she was black. He got fired and has now been replaced by former Manchester United defender Phil Neville who is taking Hope Powell's players to the next level (and claiming all the credit for the team that actually, he inherited rather than built). This was the crunch match of this season's tournament. In real terms, the winner of this match is likely to win the title. Last season the French girls ran England's legs off. not so today. A sunny but chilly afternoon in South Yorkshire saw the England girls take the French on at their own game with pace and slick handling. Four first half tries gave England a half time advantage of 24 - 0 and the tries bonus point in the bag. France rallied in the second half. Pauline Bourdon (who really should put her hair up when she plays) ran in twice from deep positions and gave France some hope after the restart but England had just a little too much for them. Poppy Cleall and Lianne Riley added further England tries and it was all rounded off by veteran Outside Centre Emily Scarratt. A very satisfying afternoon. In Scotstoun on Friday night, Ireland recovered from their week one mauling by England to overcome a determined but technically lacking Scotland. The 22-5 scoreline could have been a lot worse. Ireland are heading in the right direction but the SRU need to put more resources into women's rugby. Their girls are fighting bravely but simply don't have the technical cohesion. Investing in an experienced coach would be a start. Alison Miller for Ireland was able to direct play with ease and it was only the Scots girls determination and "die-for-the-shirt" attitude that repelled wave after wave of Irish attacks. I admire the Scottish team, but I dread to think what the English and French teams will do to them when their turn comes. Italy and Wales played out a drab 3 - 3 draw in Lecce. The TV commentator for this game remarked that he was only glad that he hadn't paid to watch this game. Trips across the Alps for Italian rugby weekends in the winter are usually great social occasions. The Italian hospitality is always warm and the wine is excellent. They'd have needed a lot of it to wipe the memory of this dull encounter out of their minds. A Wilkins penalty on 30 minutes gave Wales a lead that they held until the hour mark when Michaela Sillari kicked the scores level. She should have won the game for The Azzuri but missed a last minute penalty from right in front of the posts. Best of luck to Phil Neville and your team. I can't say why Hope did what she did, but it happens. Ah yes, the evil Mark Sampson. Funny how when Sampson was under pressure the players orchestrated a deliberate show of public support. Yet when your infallible Powell was rightly sacked there was a deafening silence re support from the then current players, and more than a few past and present players took to social media to complain about her time as manager. You can say whatever you want about Powell. The simple FACTS are that under her at the Euros the women's team finished LAST. Not simply last in their group but they were the WORST performed side of any who took part. In contrast, in Sampson's first major tournament (the world cup) he took them to the semis for the first time in the teams history. They would go on and finish 3rd. So within two years he took a team that was the worst performed at the Euros to an historic third place finish. In the last Euros his team again made the semis. Four years earlier Hope's team bowed out winless having scored 3 goals in 3 games whilst conceding 7. Under Sampson they scored 11 goals in 5 games and conceded just 4. She was replaced by Mark Sampson, a man who was later found out to have a history of sexual abuse toward younger players and racist behaviour towards black players. His sacking was not related to anything he had done with the women's team...according to those who sacked him. and has now been replaced by former Manchester United defender Phil Neville who is taking Hope Powell's players to the next level (and claiming all the credit for the team that actually, he inherited rather than built). She was understandably sacked after her team finished winless and as the worst performed team in the 2013 Women's Euros. Her sacking occurred in August 2013 and yet here we are in 2019 and you are giving the credit for the markedly improved performances of the women's team after her sacking to someone whose side finished dead last some 5 1/2 years ago!!! We had a terrific female manager, Hope Powell...But she made enemies in the establishment and they threw her out and her replacement took all the credit for the crop of brilliant players she nurtured from rock bottom and who are in the team now as top professionals. Ah yes, poor Hope Powell. You seem to be of the belief that she was unfairly sacked as manager. The simple truth however is that Powell was sacked because all managers are ultimately judged by the performance of the team under their control. In her last tournament in charge of the English women's team (the women's European Championships) ENGLAND FINISHED BOTTOM OF ALL NATIONS. Her team finished winless having scored a total of 3 goals in 3 games whilst conceding 7. That was understandably not considered an acceptable result. It was also clear that she had lost at least some of the locker room with players complaining about her ruthless, autocratic rule. Her man management skills were sorely lacking as she fell out with a number of players. Lianne Sanderson for example retired from international football at the age of just 22, blaming irreconcilable differences with Powell: "As long as Hope Powell is in charge I don't see myself going back and I don't think she would want me there." Another player, Becky Easton, tweeted "If you questioned, disagreed or in anyway upset her...you would be banished for life." Everton's Jody Handley also had her say and wrote: "Only good thing to come from the tournament and media exposure is that finally people are speaking up!" Leading up to, during and immediately after the disastrous women's Euros people questioned Powel's decision making. They wondered for example why Natasha Dowie, the WSL's leading scorer at the time, wasn't selected. They questioned Powel's lack of time spent watching players from outside of her established squad. And, as England desperately scrambled for survival in Sweden, questions were asked as to why Powell had insisted on selecting six injured players for her squad and sticking with them instead of selecting players like Jordan Nobbs. Powel had more control over all aspects relating to her national team than any manager of the men's team in the modern era, and in the end she was held accountable for her teams performance. In Sweden England lost to Spain and then failed to defeat Russia, the lowest ranked team in the competition. Against France England were completely outclassed losing 3-0. Nearly an hour into the game and the French had had 11 shots on goal. England had had none! No male manager would survive such as disastrous Euros performance as England's womens team endured under Powel, and yet you seem to think that because she wasnt given special treatment after the Euros that this amounts to evidence of sexism! Turn it up. I wondered when you'd stick your fat head above the parapet on this one. For what you know about football, I'll take all your comments with a pinch of salt. You clearly know only what you've googled, and anybody but a Welshman, who calls Wales "Cymru" is either a pretentious t*** or a pretentious t***. Frankly, you're not even amusing anymore. But hey-ho.... we have to tolerate all shades of opinion and you're entitled to yours so you carry on mate. You're a lesson that we have to be tolerant of all shades of opinion, no matter how ill informed. Moving along from the ignorant Aussie troll who infests every thread I ever start, here is a round up of recent women's sport events in UK. In the WSL, Manchester City stayed top, beating relegation threatened Everton 3-1 after trailing to an early Boye-Hlorkah strike. Fran Kirby and Beth England both scored hat tricks in Chelsea's 6-0 demolition of Bristol City. The She Believes Cup starts this weekend and if Phil Neville can drag himself away from doing pundit work on Sky Sports long enough he might turn up for some of the girls matches. Five appearances on Sky last week punditing live matches when "his" team are preparing for a major championship...!! Thank goodness Mo's there to pick up the slack. In the Netball Superleague, Mavericks beat London Pulse 65-37 and Manchester Thunder beat Celtic Dragons 83-56. Wasps, Maverick, Manchester Thunder and Loughborough Lightning are starting to draw clear in the top four. In the women's 6 Nations rugby, England ran in 9 tries against Wales to win 51-12. Jess Cavanagh and Cerys Hale scored Wales first tries of the tournament. France cruised home against Scotland 41-10 to recover from their mauling by England two weeks ago, and in a tight contest Italy beat Ireland 29-27. England lead the tournament with two rounds to go and Italy lie in second place. England and Italy meet in two weeks time. If England win they would be as good as champions having only bottom of the table Scotland still to play. There's no place for complacency though and I'm sure the girls won't take the Scots lightly. Not so good in the cricket for the England girls. India sewed up the three match ODI series winning the second ODI by 7 wickets. The third ODI takes place on Thursday and then there are 3 T20 matches before the girls tour moves on to Sri Lanka. In the indoor athletics meet at Birmingham, Laura Muir showed her growing maturity by breaking the existing British record for the mile by 5 seconds. I am so pleased for Laura...she's had a lot of promise for a long time and now she is starting to deliver. If she maintains her progress we could be looking at a serious challenge for a 1500 meters gold medal at the Olympics next year. Holly Bradshaw won the pole vault. She's always performed well indoors and now she has to transfer that form to outdoor events where for no known reason she seems to struggle. The European Indoor Championships take place in Glasgow this weekend. Expect Laura Muir to be a big favourite with her home crowd. Go Laura..!! First female football player to get a full scholarship. Pretty awesome. Are we really going to pretend that lingerie football isn't a complete slap in the face to women's sports? "Sure, women can play football, as long as they're almost naked!" I'm assuming the poor athletes are doing so in hope to be taken seriously as (American) football players one day, but I don't think running around in underwear is the way to do it. I’m fairly certain it was viewed as a slap in the face for many serious female athletes. Rest assured, though, nobody involved took it seriously, including the players. It was viewed as nothing more than an entertainment money grab for googly eyed men. Archive it with French Postcards, peep shows, x-rated movie houses, and mud wrestling rather than something belonging in a sports discussion. The US Collegiate system has a long established history of providing first class athletes in a variety of fields. I hope she does well and is successful. Keep us posted on her progress, please. I quite take that point and although I'd rather sportswear for women was more practically and less sexually alluringly designed (female track athletes running in, what are essentially, their knickers....?? Why not proper athletics shorts...?) the views of female athletes that wear them are essentially that if it's comfortable, allows ease of movement, and is appropriate to the sport being played, then they're happy to wear it. Not my thing at all, but feminism is all about empowering women to make their own choices. If they are happy to wear these uniforms and accept them on the basis that it is what they need to do to play their sport, then accept them.... at least until their participation is established. I'm sure that in the future, those who want to rebel against this type of clothing will make their voices heard. The bottom line is: Is this sort of clothing exploitative..?? I would say it is and I personally wouldn't have it. But it's up to them - the players - to decide and fight their corner on that. 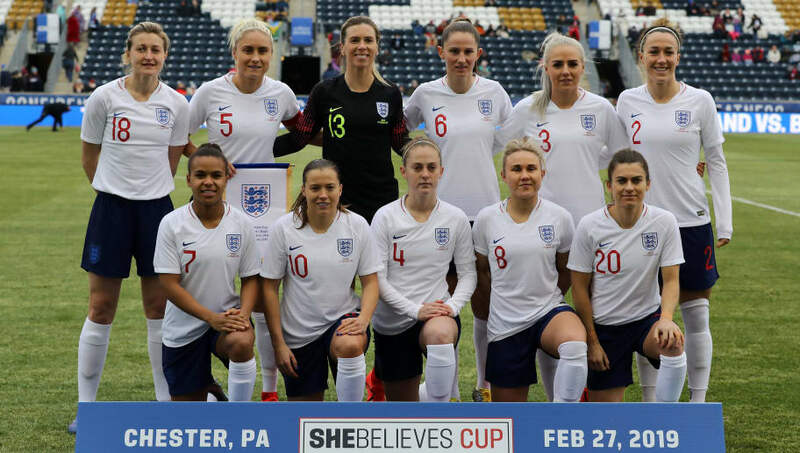 England got away to a good start in the She Believes Cup beating Brazil 2-1 after going behind to an early da Silva penalty. Ellen White levelled the scored shortly after half time and Beth Mead struck the winner with a quarter of an hour left to play. USA drew 2-2 with Japan in a very closely contested match. Megan Rapinoe put the Eagles in front but Emi Nakajima equalised just after the hour. Alex Morgan restored USA's lead but Yuka Momiki robbed USA of a win with an equaliser in stoppage time. This means England lead the tournament after one match. They play USA today, kick off at 21.30 GMT. Brazil face Japan in an earlier kick off. In the early kick off, Japan beat Brazil 3-1 with goals by Momiki on 44 minutes and late strikes by Kobiyashi on 80 mins and Hasegawa on 85 after Debinha had brought Brazil level on 57. Manchester City duo Steph Houghton (36 mins) and Nikita Parris (52 mins) scored for England in a thrilling draw. 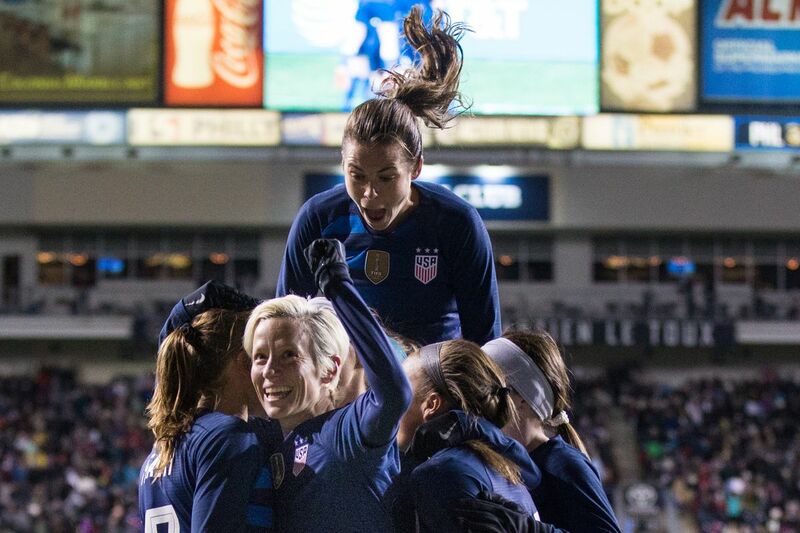 England's goals were sandwiched by Megan Rapinoe's 23rd minute opener and Tobin Heath's equaliser on the hour. Either side could have won this match and neither side will be happy with the stalemate, although England will be the slightly happier of the two as they now sit in second place in the table above USA in third. Japan top the round robin group on goal difference, having beaten Brazil 3-1. England are level with them on points (4) USA have two and Brazil are out of it with nothing to show for their efforts. Japan vs England should decide who finishes top of the group and USA will be looking for a win over Brazil in the hope they can pinch second place over whoever loses between England and Japan if either of those teams win in their match. Should England and Japan draw, and USA beat Brazil, then goal difference would be the deciding factor. In that instance, England could only finish in second place at best and if USA won by 2 or more goals they would top the group and push Japan down into second place and England down to third. There's everything to play for. Why do women like to play Pacman? Why do women play such games?